The NAIOP Research Foundation has published a new white paper titled "Creating a Private Equity Fund: A Guide for Real Estate Professionals," by Jan A. deRoos, Ph.D., HVS Professor of Hotel Finance and Real Estate at SC Johnson College of Business, Cornell University; and Shaun Bond, Ph.D., West Shell Jr. Chair in Real Estate at Lindner College of Business, University of Cincinnati. 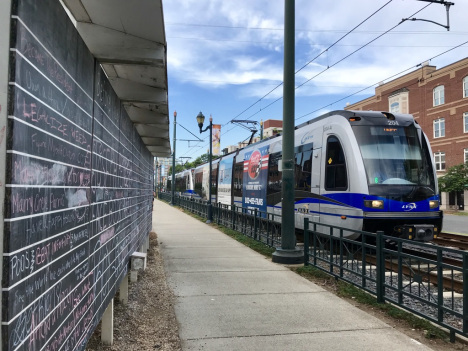 The Charlotte City Council will vote next Monday night on the new Transit-Oriented Development (TOD) Ordinance, following a unanimous recommendation of approval today by the Council’s Transportation & Planning Committee. REBIC and our members have been closely engaged in the process of drafting the new TOD ordinance over the past 18 months, and the City planning staff, have incorporated many of our suggestions into the ordinance — from changes in maximum parking ratios to reduced open space requirements. And while we are pleased with many aspects of the TOD, we remain concerned that its limitations on building height could negatively impact economic development in Charlotte’s transit corridors. The ordinance currently caps base height at a maximum of 130’ in the TOD-UC district, its most dense, and offers developers additional height in exchange for bonus points that advance other City objectives, like affordable housing, transportation improvements or energy efficiency. While we support each of these policy goals, we believe City Council should do everything possible to encourage density in our transit corridors, and not restrict itself from considering economic development opportunities that would otherwise be limited by the building height caps in each TOD district. Property managers are using “dynamic and multidimensional” information for operations but not yet for tenant engagement. A white paper published by the NAIOP Research Foundation titled “The Office Property and Big Data Puzzle: Putting the Pieces Together”found that office building owners are capturing, storing and analyzing data to operate building systems but not to recruit and retain tenants. Redevelopment is almost 100% of what's going on in retail real estate. Today developers are selecting premier spots where they have access to customers, and that often means reusing existing retail locations. The forecast for net industrial space demand will remain steady in 2019. According to Dr. Hany Guirguis of Manhattan College and Dr. Joshua Harris of New York University, demand will remain at approximately 57 million square feet per quarter for 2019. That is unchanged from the average actual 2018 quarterly absorption of 57 million square feet. Industrial absorption in the final half of 2018 came in slightly above expectations due to higher consumer spending and retail sales, which were buoyed by a strong job market. Industrial demand will be off to a strong start in 2019 with a potential tapering off into 2020 as rising interest rates moderate the economy’s growth rate. At present, the risk of a downturn in the industrial space market appears slim as the nationwide vacancy rate sits at a historically low 7.0 percent. Further, gross and net asking rents are at all-time highs, indicating that the market supply continues to tighten at a steady rate. The NAIOP Research Foundation has published the NAIOP Industrial Space Demand Forecast for Q1 2019. Demand will remain at approximately 57 million square feet per quarter for 2019. That is unchanged from the average actual 2018 quarterly absorption of 57 million square feet. At present, the risk of a downturn in the industrial space market appears slim as the nationwide vacancy rate sits at a historically low 7.0 percent. Further, gross and net asking rents are at all-time highs, indicating that the market supply continues to tighten at a steady rate. While data are somewhat suppressed due to the U.S. government shutdown that took place from December 22, 2018, until January 25, 2019, economic indicators point to moderate growth. Overall U.S. economic activity will remain steady in 2019, with annualized rates of GDP growth in the mid-2 percent range. Steady growth is the biggest factor keeping the industrial demand forecast stable. The labor market and overall consumer confidence are also expected to grow for the year, with industrial space demand increasingly influenced by consumer spending. Overall, the U.S. industrial real estate markets appear to be healthy and stable. It is the asset class that is potentially in the best position to weather any macroeconomic downturn that may come in the next several years. The NAIOP Research Foundation has published the Economic Impacts of Commercial Real Estate report. The resolution of trade wars and higher tariffs instituted in 2018 and how these might affect U.S. exports, which increased their contribution to GDP expansion in 2018. The Charlotte planning department has postponed a public hearing for its new Transit-Oriented Development (TOD) zoning ordinance from February 25th to March 18th, as it revises the proposal to incorporate feedback from REBIC and other stakeholder groups. While the updated draft isn’t scheduled to be released until the week of February 18th, it is expected to include an expanded menu of incentives to encourage developers to include affordable housing, make infrastructure investments, or participate in the City’s Minority, Women and Small Business Enterprises (MWSBE) program. The current draft only offers developers an opportunity to increase their building height, which REBIC cautioned could be of limited value to developers. In a letter to City staff last month, we encouraged the inclusion of incentives that would provide variances on building length, building articulation, or required open space. Opportunity Zones are here, and the commercial real estate industry is paying close attention. Established as part of the Tax Cuts and Jobs Act in 2017, the new government program is designed to stimulate struggling economies across the nation. Handpicked for specific economic criteria, over 8,700 designated census tracts are attracting investors and developers of all kinds for their tax breaks on capital gains. While the benefits for investment are clear, many commercial real estate professionals are a little less clear on how to start their search. How, exactly, can investors efficiently locate and analyze these assets for investment? The answer lies in off-market data. As more players enter the Opportunity Zone market, off-market data and commercial real estate technology provide a simplified search experience to find prized properties before others do and empower stronger deal-making across the country’s most lucrative markets, in areas such as Chicago, Los Angeles and Miami. Commercial real estate is in the midst of a digital revolution, and some of the biggest upheavals will affect professionals who work closely with property owners and tenants. Technological innovation is accelerating in the commercial real estate space, and it has the potential to disrupt a large segment of the brokerage business. Enhancing predictions and planning: What do customers want and when? Being able to predict the demand of shoppers can make supply chains and warehousing more proactive. Greater use of consumer spending data through algorithms should make supply chains more nimble and reactive. Keeping a closer eye on goods: Technological advancements mean it’s now easier to track and trace products than ever before. Track and trace systems will create more certainty along the entire supply chain. Getting more from distribution networks: Many businesses only review their distribution networks on an infrequent basis, often using incomplete data sets and with limited insights on developing trends. This is where big data could prove useful. Delivering goods more efficiently: The growth of e-commerce has meant that more packages leave warehouses than enter them; one box of gadgets from a wholesaler could go on to 10 or more separate addresses. Being able to improve scheduling and routing of deliveries is a potential cost cutter especially when it involves multiple drops. Reducing risk from the elements: Big data can help lessen supply chain risk from external factors – such as the weather. Creating smart warehouses: Another way to improve efficiency and cut costs is within the walls of the warehouse itself. More connectivity – for example through new 3D digital tools – can boost the efficiency of operations inside, as well as energy performance. If you’re familiar with the movie Moneyball (based on a nonfiction book of the same name), you know that in the film, the Oakland Athletics general manager and assistant manager take a unique approach to building their baseball team within the constraints of their limited budget. Instead of relying on the more subjective information often used by their competitors, like the way a certain player runs or wears their uniform, the two used a sophisticated analysis of multiple empirical data sets to track players’ in-game activity and statistics to guide their decisions. At CRE.Converge 2018 in Washington, D.C., Brookfield’s Global Head of Corporate Development/Executive Vice President Kevin Danehy likened the Athletics’ evidence-based approach to the way building owners and operators could leverage big data. GOVERNING reports that Amazon’s decision to locate its second headquarters in already economically strong areas drew the ire of those who had hoped the company would choose a city that needed a boost. However, landing a large corporation isn’t the best way to improve a local economy and spur job growth. The article cites a report by the Urban Institute and the Brookings Institution that advised cities to concentrate on growing existing business and not luring outside companies. “Most job expansion and contractions come from birth and deaths of homegrown businesses or expansion or contractions of existing home-based businesses,” said Megan Randall, a coauthor of the report. The report also cautioned that tax incentives do not play a significant role in attracting businesses. Although New York City and Virginia offered tax subsidies to Amazon, the company claimed the incentives were not the deciding factor, but rather the highly skilled and educated labor force in each of the locations. Offering generous tax incentives can be especially onerous on localities which do not have the fiscal strength of New York or Washington, D.C., and force difficult trade-offs in levels of public services. Additionally, when a city offers tax giveaways to lure a company, the government goes into the negotiation at a disadvantage because it may not have all the information about the company’s relocation criteria. In some cases, a company may choose a city it would have moved to anyway, pocketing the tax incentives even though they weren't a requirement. The U.S. office market posted solid net absorption levels in the second and third quarters of 2018 of 18.0 million and 11.0 million square feet, respectively. This level of new leasing is likely due to higher-than-expected economic growth and the subsequent demand brought about by jobs created in the office-using sectors. Due to third quarter 2018 U.S. GDP growth of 3.5 percent and a current unemployment rate of 3.7 percent, 2018 is expected to register nearly 13.0 million square feet of net absorption per quarter, significantly outpacing 2017 and 2016 when the quarterly figures averaged 9.5 million and 10.4 million square feet, respectively. The forecast is strongly dependent on continued annual economic growth near 3.0 percent, which seems plausible for all of 2019 and into 2020 given current data. A Gensler study quantifies that the right design can result in great experiences, which in turn are great for business. Today, the goal of every project that forward-thinking architects design is to give people positive experiences. Clients in every sector, including commercial real estate, are struggling to keep up with the dramatidec evolution of how people work, live and shop today – and those who aren’t are sacrificing business performance. To better understand – and to quantify – the link between design and delivery of a great experience, Gensler developed the Gensler Experience Index, a first-of-its-kind mixed-methods research approach to create a holistic Experience Framework for understanding experience and quantifying the effect of design on that experience. The Gensler Experience Index is the result of a rigorous investigation that combined qualitative ethnographic research with quantitative research to identify the design factors that are most important in creating exceptionally great spaces and places. After several years, five roundtables, 60+ hours of one-on-one ethnographic observations and a survey of more than 4,000 consumers, the Gensler Experience Index quantifies and brings greater depth to what many in the design industry already knew instinctively – that great design is an important component of great experiences. Demand for retail properties has taken quite the hit in the wake of rapid e-commerce growth. Companies like Amazon continue to eat up industrial spaces, while brick-and-mortar retailers seem to lose foot traffic by the day. As that demand has washed away, however, a sturdy foundation has emerged for real estate developers to rebuild and reinvigorate the retail industry as a whole. It has become clear that value remains in the development and reuse of retail spaces across the country. The NAIOP Research Foundation has published the NAIOP Office Space Demand Forecast for Q4 2018. 2018 is expected to register nearly 13.0 million square feet of net absorption per quarter, significantly outpacing 2017 and 2016 when the quarterly figures averaged 9.5 million and 10.4 million square feet, respectively. The current macroeconomic expansion will most likely continue beyond next summer, which will officially make it the longest sustained economic growth period in U.S. history. However, the biggest limitation to the expansion of firms that use office space is likely to be the ability to hire qualified employees. Regarding office space demand, the ultimate determinant of long-term growth will be how the business sector reacts to rising wages and interest rates. Where are capital markets now, and where are we headed next? At CRE.Converge 2018, experts engaged in a candid conversation about what they’re seeing in CRE investment, and shared their insights, strategies and predictions for the market. Moderator James Cassidy, executive managing director with Newmark Knight Frank, led the discussion.